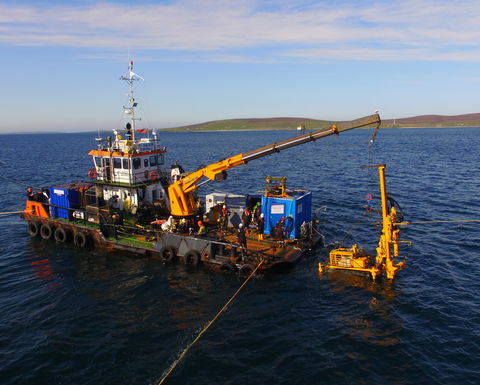 Rockbit UK's patented subsea Raptor rock anchors, which were named as one of the finalists in this year's Ground Engineering Awards' Equipment Innovation category, will be used to moor SME's PLAT-O tidal energy platform. In the UK, offshore work is governed by several regulatory bodies, which, in the case of this project, meant both the Scottish Environmental Protection Agency (SEPA) and also the Crown Estate. It is now an essential part of seabed projects' planning applications to ensure that no waste is left on the seafloor and that the area is returned to its original state. Unseen hazards (or structures) that are left behind can cause damage to submarines and ships or even snag fishing nets. The Raptor anchors were drilled in and tensioned by one of SME's subsea rotary rigs, the AROV (Anchoring Remotely Operated Vehicle), which was based on a Massenza drilling rig design and re-engineered for this subsea application. Marine operations were performed from Leask Marine's multicat C-Salvor. The Raptor anchors can secure a range of loadings from 10-400t per anchorage without the need for grout. This means that they are particularly suitable for tidal energy, offshore platforms, fish farms and wind turbines. In addition, they can be mechanically un-tensioned and removed, leaving nothing behind on the seabed. 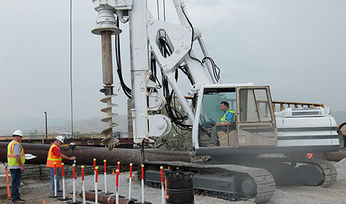 Following years of development and months of test drilling in similar geology on dry land on Orkney, Scotland, the real test was the location of the installation. 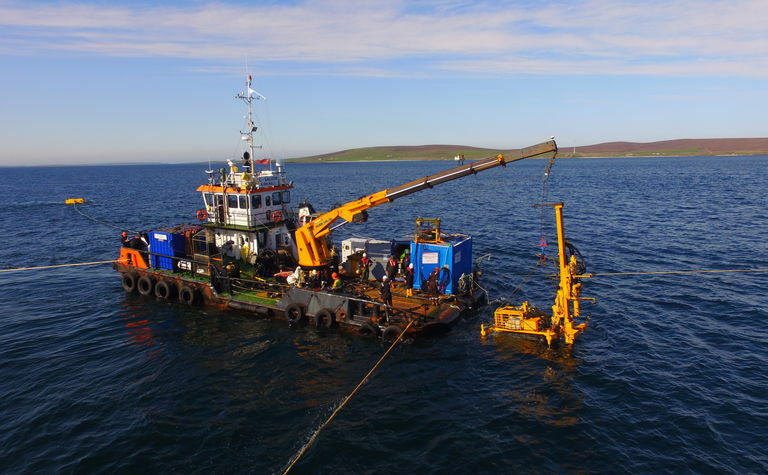 The offshore works were carried out at the EMEC, located at the Fall of Warness off the coast of the Orkney Isles at the northern tip of the British Isles. Being the meeting point of the Atlantic Ocean and North Sea, this extremely challenging channel has 35m+ depth of water coupled with fast-changing and -moving currents at a peak flow of more than 4m/s, as well as freezing weather conditions. The extreme tidal conditions are in fact ideal for the purpose of the seabed anchors, as they are to be used to anchor down a submersible tidal energy generator named PLAT-O, designed and built by SME. External factors such as a four hour trip to the location and extreme tides and currents only allowed a window of 30 minutes for each of the rock anchors to be installed. This meant that the workers on-site had to be highly skilled and up for an adventure. Jason Laing, the owner of Welltherm Drilling, a UK-based specialist drilling contractor, was the driller, along with Rockbit UK's operations director Paul Cravagan giving technical support. Laing describes the task at hand: "The AROV was controlled remotely from the service vessel. I had six cameras and a selection of pressure gauges to show me what the drilling rig was doing once we were set up. 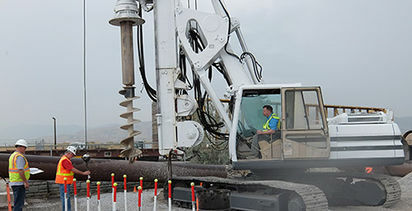 The 3.5m-long Raptor has a special tricone rock bit that drills the hole, and once installed to depth, the anchor reams itself in and tensions to the prescribed reaction force." Alan Vasey, the inventor of the Raptor subsea anchor and chairman of Rockbit UK, is extremely happy with the development of the Raptor anchor. "I am very proud to see the Raptor anchor develop from an idea, then design through to a proven innovative piece of patented equipment. It is a real step forward in providing secure anchoring in the most demanding environments and it is looking to make substantial cost savings over the conventional type of gravity or grouted anchors," he says. Now marketed towards both subsea and land-based applications, Raptor anchors showcase the fact that the drilling industry can still provide innovations for modern-day problems.